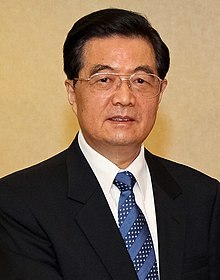 Hu Jintao (pinyin: Hú Jǐntāo, pronoonced [xǔ tɕìntʰáu]; born 21 December 1942) is an umwhile leader o the fowerth generation o leadership o the Communist Pairty o Cheenae. He wis General Secretary o the Communist Pairty o Cheenae frae 2002 tae 2012, Chairman o the CPC Central Militar Commission frae 2004 tae 2012 an Preses o the Fowkrepublic o Cheenae frae 2003 tae 2013. Hu haes been involved in the Communist pairty bureaucracy for maist o his adult life, notably as Pairty secretary for Guizhou province an the Tibet Autonomous Region, an then later First secretary o the Pairty Central Secretariat an Vice-Preses unner umwhile leader Jiang Zemin. Hu is the first leader o the Communist Pairty withoot ony signeeficant revolutionar credentials. As such, his rise tae the leadership representit Cheenae's transition o leadership frae establishment communists tae younger, mair pragmatic technocrats. Durin his term in office, Hu reintroduced state control in some sectors o the economy that wur relaxed bi the previous admeenistration, an haes been conservative wi poleetical reforms. Alang wi his colleague, Premier Wen Jiabao, Hu presided ower nearly a decade o consistent economic growth an development that cementit Cheenae as a major warld pouer. He soucht tae improve socio-economic equality domestically throu the Scientific Development Concept, which aimed tae big a "Socialist Harmonious Society" that wis prosperous an free o social conflict. Meanwhile, Hu kept a ticht lid on Cheenae poleetically, crackin doun on social disturbances, ethnic minority protests, an dissident figures. In foreign policy, Hu advocatit for "Cheenae's peaceful development", pursuin saft pouer in internaitional relations an a business-orientit approach tae diplomacy. Throu Hu's tenure, Cheenae's influence in Africae, Latin Americae, an ither developin regions haes increased. ↑ "Kuhn, Robert Lawrence: Hu's Political Philosophies" (PDF). Esnips.com. Retrieved 13 March 2010. This page wis last eeditit on 10 Apryle 2017, at 03:08.